I’m going to keep it brief today. Not as brief as yesterday. That was pretty brief indeed. I’d be surprised if you even caught it. Today I’d like to talk about flowers. 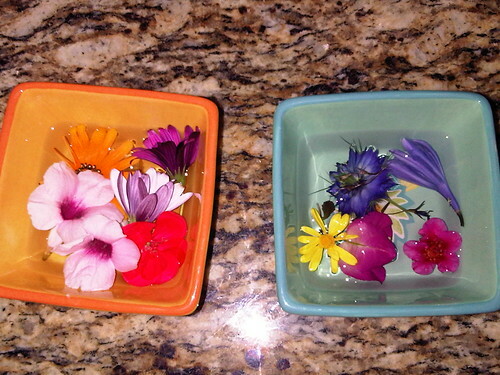 Flowers and negotiation. When we go on walks these days, we come back with a harvest. You can see two days haul in the picture, you’ll find somewhere in the vicinity of this sentence. The market forces in a typical walk work thusly: Abigail is working to make sure she gets as many flowers as possible, and I am working to limit this number as much as I can. Here’s an example of how our conversations might go. As you can see, without parental controls, we’d go through a period of rapid floral inflation. Plus, when we get back, she immediately announces, “I want to put them in water. Fresh water.” So we’d be out of bowls, too. 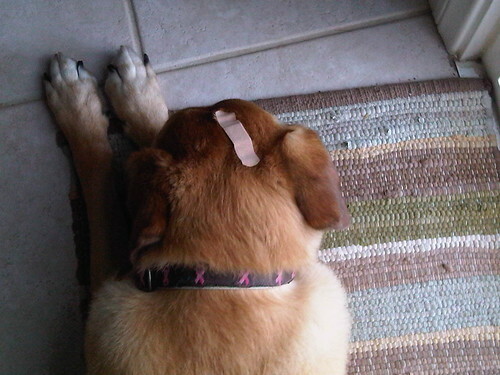 On a tangential note, related only by the Abigail, here is a picture of Maggie with a band-aid on her head. These take off more fur than you’d expect. This entry was posted in Abigailia and tagged Band-Aids, Flowers. Bookmark the permalink. “These take off more fur than you’d expect.” That made me laugh. A lot. Surely you are actually contributing to inflation — or at least keeping rampant deflation in check — by regulating supply? The inflation I’m looking to regulate is the volume of decaying flowers in my kitchen. Although I’m also keeping the local population of flora from deflating, so there’s that.